In my life and in my vocation, I am deeply committed to the Christian Church and what it stands for. I find deep meaning in the understanding of that a life with God comes to us through the life, death and resurrection of Jesus. I also find meaning in many of the rituals, symbols, and traditions of the Church. I also stand as an insider looking out on a world that seems increasingly uninterested. It feels like being the proprietor of a shop that only sells winter clothing in the middle of May. I know what I have is useful, but no one seems very interested, at least not right now. Recently my wife and I had lunch with a couple who recently retired and has spent a good portion of the last year traveling. The wife grew up in a Jewish family; it sounds like she does not particularly practice her Jewish faith, nor her husband’s Christianity. She said, “I have not felt particularly drawn to Christianity.” With passion and intensity in their voices and a sparkle in their eyes they told us about a recent trip to Ethiopia. I wish you could have heard her describe their participation in the Epiphany celebration of the church in Ethiopia. Epiphany is perhaps the most important celebration in the Coptic Church, the time when they celebrate Christ’s birth. The celebration has the people dancing through the streets in procession to the church. The people are all dressed in white, many of them in robes; they carry crosses decorated with colorful fabric, and they twirl colorful umbrellas, part of their liturgical decoration. She told about how they were invited into the procession, joining with the Ethiopian Christians in their singing and dancing through the streets of the town; they were a bit of a novelty as the only white faces in the processional crowd. When they got to the church, she was hot and tired, and found a place to sit just outside the church door. One of the priests came and sat next to her and engaged in conversation, taking delight that she lived in the midwest, where he had spent time in theological training. She was dumbfounded that on this most important day of his religious year, a time when he clearly had many things to think about and do, he would take the time to engage in conversation with a stranger he would likely never see again. As a token of their visit, she bought a cross pendant. 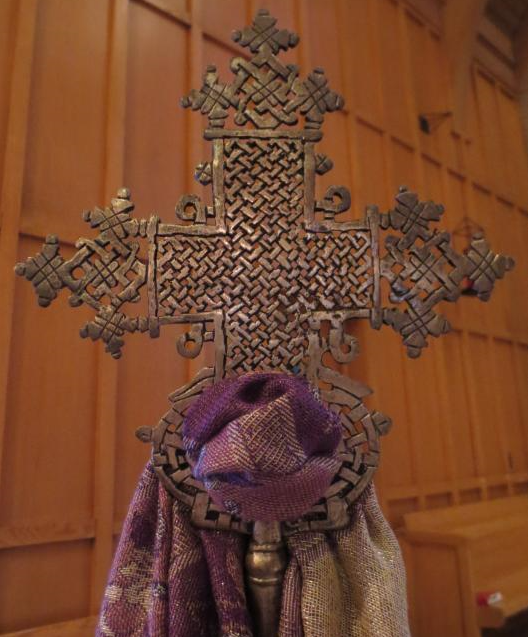 She said, “I feel a little funny wearing a cross around my neck, but in that moment, I was drawn to Christianity.” That Ethiopian Christian cross had become for her a sign of life, not as a generic religious symbol, but as a reminder of the warmth and hospitality she had experienced. I find a pretty striking lesson for me in my own life as a Christian and as a pastor in the church. The theology, ritual, and symbol that I find so meaningful will not likely be meaningful to anyone outside the church unless and until they experience the love and grace of God embodied in the warmth and hospitality of people like me. Fewer and fewer of them are coming onto our turf to give us a chance to demonstrate that love and grace. The chances are slim that it will be through Epiphany celebrations that wind through the streets of our communities. But it will be important (dare I say essential?) that we find our own ways to get the Body out of the building and into the streets. This entry was posted in Life in the church and tagged body of Christ, church, Ethiopian Church, evangelism, hospitality, incarnational presence on March 24, 2015 by Jim Honig. Pr. Jim: Your thoughts inspire me to ponder on my own thoughts about the God who loves me and created me and all my fellow citizens of the world. I like being inspired by you. Did you mean to post this blog again? Thanks, Bob, for taking a look at this reflection. yes, you did hear the story twice. On line only once!! Great post James! A great example of what the church can be. What I find striking is that your friend valued the time the pastor of the church spent with her – relationship. Yes the procession is fun and interesting, especially for a visitor – something exotic even. But it was the time investment of the pastor with her that made the difference. This is Christianity at its finest. I’m grateful for your faithful following and commenting on my posts. As you point out, my friend’s experience is a call to those of us in pastoral ministry to make the one on one relationships a priority, even when there are other institutional tasks calling us away. And thanks again for your thoughtful response. James, Thank you for your posts. They are always well thought out and help me to think about the things you write about. I just try to share what your writing inspires in me. Keep up the good work.